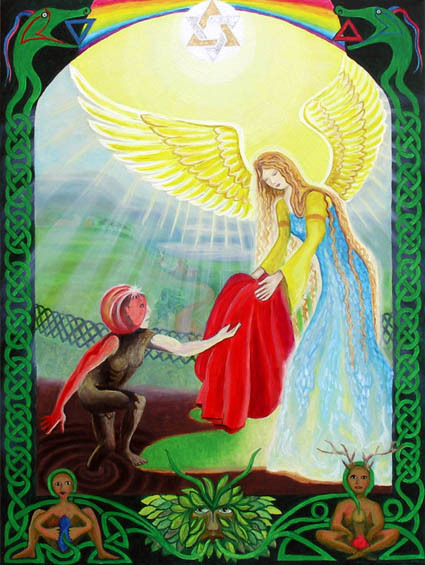 In 2011 I was commissioned by Mr. Adam McLean to participate in his ongoing Splendor Solis Art Project, wherein artists have been asked to recreate their own version of the eighth image from the Splendor Solis manuscripts of the Resurrection from the Swamp. I found it an intriguing image, and the commission came at a time when I was experiencing events in my personal life which seemed to resonate with the imagery. In some ways it reminds me of the Tarot Moon card in its most positive aspect. I really enjoyed creating my interpretation of this image. 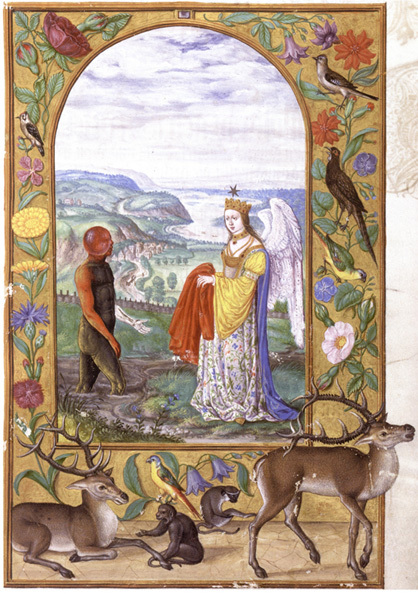 “I have always been fascinated by the eighth image from the Splendor Solis manuscripts. This shows the strange figure of a man emerging from a swamp. One arm is white, the other red and his body black, thus incorporating the main colour changes in the alchemical process. His head is metamorphosed into a glassy sphere, and that I find a wonderful image. As he walks out of the swamp, an angel figure appears and hands him a red robe.” Mr. McLean hopes to mount an exhibition of the artworks that he has commissioned on this theme. For further information, click here. Emerging From the Swamp, by Harry Wendrich, is available to purchase as a Fine Art Print or as a Giclée Print, sized A1, A2 or A3. Both types of print are printed with genuine archival pigmented ink on heavyweight acid-free paper. Please use the Contact Us form to discuss your requirements until the Gallery Shop is updated. The original manuscript of these plates, dated 1582, is held in the British Museum, although perhaps the earliest version, dated 1532-35, may be found in the Kupferstichkabinett (Museum of Prints and Drawings) in Berlin’s Prussian State Museum. The complete set of the 22 Coloured Plates depicting the 22 Alchemical Stages of Saloman Trismosin’s Splendor Solis are also available for browsing from The Hermetics Resource Site, where further information regarding this series of images can be found.